When I was in 7th grade, I signed up for an elective called Puzzles and Games. It wasn't exactly a popular choice, back in the 80s, when I suppose the cool kids took things like Art (and I did like that too) or Home Economics for fun. Not only was the class a mixed bag of misfits (with me being the only female student), but our teacher was too. In her 50s, her long, jet-black hair reaching far past her waist, many of the students called her a witch. She had a raspy voice, earned from years of smoking, as we could tell from the cigarette odor that hung on her clothes. I was a little nervous going into the class - after all, no one I knew had signed up for it, and she did have a reputation. (In retrospect, she must've heard the rumors and found them amusing, because there is a picture of her dressed in a tall, pointy black witch's hat in the yearbook, a stern frown upon her face). In spite of my insecurities, I loved puzzles! So I thought I would give it a try. Each day, lab tables were covered with jigsaw puzzles, my favorite being a huge one covered in hundreds of hot dogs. Hot dogs with relish, hot dogs with slaw, hot dogs with ketchup and mustard and all! It took us weeks to finish it, but it was a glorious puzzle. Our witch teacher said that she didn't care what we did, as long as we were learning something. So the other part to the class, the 'games' portion, was chess. I didn't know how to play chess. But I learned that semester. And while I never was the most strategic of chess players (I have never been very good at predicting moves long in advance), I enjoyed the game. It's a good thing I took that Puzzles and Games class. Because now I have a six year old who spends his every waking moment wanting to play chess. He joined the chess club at school, and is so passionate about learning to play well. And I have to say - while I can still beat him, for now, I'm pretty sure the tables will turn in the near future. 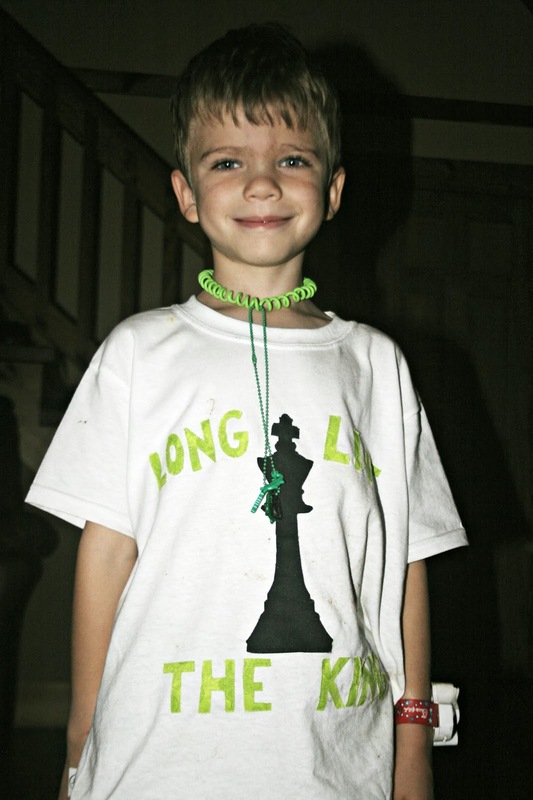 I even made Pierce a special chess shirt, which says, "Long Live the King". How about you, readers - did you ever take an unusual class or elective as a kid? I like that shirt, very good. I never had a neat class until college when I took black and white film photography. Oh it is wonderful that you have the same interest in chess you are going to have so many hours together. Wow -- chess! That's awesome. I took the first environmental education class at my high school -- lots of field trips and I had a crush on the male teacher. Lol. Good memories. It's great when you have "characters" as teachers - you always remember them. I still remember my geography teacher who would belt out "Big Yellow Taxi" to teach us about urbanization! Oh my GOSH, this is totally cool, because you know that Phil teaches chess at the local elementary school. He would be netter able to tell you than me that chess teaches a certain kind of thinking and is so good for kids. Many elementaries do not even have chess clubs, your school is cool to even do this. LOVE the shirt, there is no end to your awesome mommy talents!!! How fun having a teacher like that! It's always fun to have memories of teachers and classes like that. I don't remember having anything as unique as Puzzles and Games in elementary or middle school. But I do remember doing some fun projects in art class. I remember having a mammal's backbone (like a cow or something) and a skull (very Georgia O'Keefe), or maybe it was just a model/reproduction of one that we had to sketch. When my mom saw my sketch, she said, "Oh, you could be a medical illustrator!" Love Pierce's shirt and so happy he is passionate about chess. Nothing to unusual for me but I do remember one teacher who chewed grape bubblegum...her room always smelled "grape!" how cute. we have a picture puzzle on the table right now. (my sis is visiting). I think that kind of strategic thinking will serve him well in life! That's so cool he's learning to play chess--and that class YOU took sounds pretty awesome, too. Especially taught by a woman with a sense of humor. My favorite elective? French. I'm still nuts about the French and was sad we moved to a new place where French was NOT an elective, so I only got to study for 2 years. Nice shirt. Good boy... So young and have a passion on chess... Wonderful. Chess is a fabulous game! I'm not very good at it, but i do enjoy it. :). It's wonderful that Pierce enjoys it so much. Great shirt! Thinking ahead is not my strong suit, so I never learned to play chess. We were never offered anything interesting in school. Oh wow, its great Pierce is learning to play chess. I have not played chess in ages. I should think about teaching our grandchildren to play chess it is a great strategy learning game. My husband tried to teach me to play chess but I didn't take to it. I'm not very strategic! He can plan out his moves way in advance but my brain just doesn't work like that. At the risk of sounding sexist, it seems like men are more suited to that kind of strategic thinking! I was taught chess years ago and I don't even think I remember how to play. Horrible huh? Nope... no specialty classes for me. I recall just wanting to get through school and have it done with. I did have a couple of mean teachers that did their best to try to make me feel stupid. They probably chose the wrong profession. My youngest brother could often forecast how many moves one had left before he beat them and I taught him chess. Chess is a great game. Your son will meet some nice people if he sticks with it. I guess he should grow up to be a Naval Officer. Chess is popular in the wardroom on long floats. That is such a cute shirt you made Pierce and he looks happy. He plays chess at 6??? Wow. I'm very impressed. I loved my art classes in school....everything else was bores-ville. What a cute memory for you. I went to a small rural school, so we only had the basic classes to choose from. I never have learned chess, but I do love to do logic puzzles. Love Pierce's shirt. We were given all the electives --6 or 8 weeks at a time--in 6th grade. Girls and boys BOTH got metal shop, wood shop, drafting, cooking, sewing, and teen living (sort of a grooming class). I have the best memories of those classes and excelling in both wood and metal shop. I was glad that we were forced to take all of them because I think I would have been embarrassed to sign up for metal or wood shop if no other girls were doing it. Sounds like you had a great teacher with a lot of self-confidence. Basket weaving - I think my dad just about "lost it"
I took a sewing class in high school. I don't think I learned to do it well, but it was fun! I am so impressed with Pierce! Six years old and playing chess--I think that's awesome. I didn't have many fun classes in h.s.--worked on getting those "go to college" classes in. But I did take journalism in 12th grade and enjoyed learning a bit about photography and developing photos in a dark room. I've always wanted to learn chess. That's great you and him are into it. I took creative writing and art mostly. In college we had workshops to take. We had to put down our top 3 choices. I got my 3rd choice. I was thinking, "Go figure!" It was a great workshop. It was a paper clothes making workshop. We could only use paper. The rules were that we couldn't use string, or thread to sew. Glue, and other mediums were ok to use. I made a Kimono out of a paper table cloth, and pressed flowers. A friend of mine made a Satchel out of paper, paint and we found that putting shoe polish and protector helped it be waterproof. It was all about problem solving to me. I don't know how to play chess! I have never heard about that in school even with my kids going in the 80's.....puzzles!!! That is awesome that Pierce loves to play chest. Wow, they didn't offer Puzzles and Games in my school! Your son is a handsome boy. It's very interesting that he likes to play chess. At this point, nobody has won me a game of chess for many years. My grandfather used to teach me how to play poker and chess when I was a little child, and I kept on playing throughout my lifetime. You see I am in my 6th decade of playing games, and it will be hard to beat me. However, one day, I know for sure, I shall play and rest in peace in Heaven with the Lord. I take one day at a time, just like in the game of chess, for I know tomorrow is not promised for anyone.